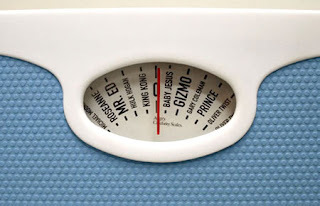 Skinny Gourmet Guy: To Weigh or Not to Weigh? I know so many people that refuse to step on a scale. It's the one gadget that can ruin your day in no time flat. But I think it's crucial to know how much you weigh at least on a weekly basis. This way, you can see if things are going south and you can do something about it before things really get out of hand. Mirrors can lie, we can lie to ourselves and put together pretty good camouglage to hide the excess pounds even from ourselves. When I was 45 pounds heavier I wore a t-shirt, untucked, and cover that with a button down oxford shirt, also untucked. "What, me fat? No, I'm wearing two shirts and they're UNTUCKED! I'm actually about the size of a chiuaua underneath all these shirts!" The West Side YMCA has two scales in the Men's Locker Room. One I have dubbed the "nice" scale. It's an old fashioned scale that operates on springs. If you don't like the reading you can hop on and off and get all sorts of different readings. 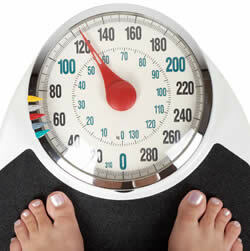 I've lost 5 pounds in a matter of seconds by getting on and off it several times until I get the reading I like. You can wait for 10 minutes to use it if you get behind someone who finds the readings dissastisfying. If I get good news on the nice scale, I'll go to the other end of the locker room and take on the mean scale. It's just like the scale you find in a doctor's office. I always weigh at least 2 pounds heavier on that scale. You can get on and off from now until the cows come home and it will give the same reading. ﻿So I guess I can be in denial, too. But at least even the nice scale gives you an idea of where you stand. I found a scale on the internet called The Celebrity Scale. Rather than giving you your weight it tells you which celebrity you resemble size-wise. It compares you to anything from Gizmo from The Gremlins to Mr. Ed to King Kong.﻿ Euphemisms are fine, but I don't think I would find anything sugar coated to being compared to Mr. Ed or King Kong. With my luck it would probably compare me to Richard Simmons. 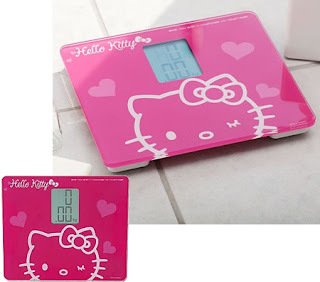 I found a Hello Kitty scale on the internet as well. I don't really like Hello Kitty and I can see myself going after it with a hammer if the news were bad enough. Here's the bottom line: force yourself to get in the habit of weighing yourself. I weigh myself every day. I have a cut off point were it's time for full scale press damage control. My drop dead weight is anything over 160 pounds (I weighed 146 pounds this morning). If I go above 160 pounds I up the cardio as much as possible - even taking two or three classes in a day. I eliminate all of the things that are decidely non-skinny - even though I advocate healthy eating and exercise, I'll have the occasional piece of chocolate - or have pasta and garlic bread a few times in one week. I really watch the carbs and only have fish for dinner. Before you really hate me, I look like I weigh more than I actually do - I think I have hollow bones or something. My top weight ever was 190 pounds, which can look fine on someone 5'10" but on me I just looked fat. And genetics are not on my side. My family tends to be on the heavier side. My brother is quite heavy at the moment. Even though I don't like to pass up an opportunity to torture him, I will refrain from posting his picture (unless you really beg or unless he does something to really piss me off. Just kidding! Sort of! ).